This is how sports writers of the time described the excitement of the talented, young, Italian speed skater. And so it happened that Mario Trafeli, who started skating at age 14, nationally ranked by age 15, emerged as the youngest winner and first Detroiter to win the North American Outdoor Speedskating Championship against the top Canadian and American skaters. 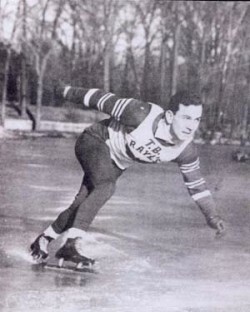 During his 12-year skating career, Trafeli went on to win the Michigan Indoor title six times, held all Michigan speed records, won the Silver Skates Tournament of Detroit, St Louis and Chicago, 1952 and 1954-winner of the two-mile Invitational “Race of Champions” held in Madison Square Garden, New York, winner of more than 40 tournaments and five national speed records. With a professional career in his sights, Mario graduated from The University of Detroit Dental School and later served as Navy dentist all the while skating, winning and setting records. In 1982, he was inducted into the Michigan Amateur Sports Hall of Fame. Mario married his dental school sweetheart and set up a dental practice in Farmington Hills, Michigan while having six children. At the age of 48, Mario took up the game of tennis. By 55, he was ranked first in Michigan Singles, maintained that ranking through age 70 when he also secured number-one Singles Midwest USTA adult ranking and for the last several years has been ranked the number one Doubles Midwest USTA, age 80 and over. The love of competition, strategic playing and good knees still contribute to his winning style. In 1982 he was inducted into the Michigan Amateur Sports Hall of Fame and also received a State of Michigan Senate Resolution. Inducted with our 2009-2010 class, Trafeli thus became the first Speed Skating inductee at the National Italian American Sports Hall of Fame.